Last spring, over dinner in Paris, a close friend of mine who runs one of the biggest opera houses outside the French capital told me: "I've got this persistent feeling that 1968 is just about to happen all over again." He had no idea that the violence would erupt in the dreary, featureless suburbs. He thought it was because the French political system had run out of ideas and credibility, and he knew the French. These moments of weakness are the times when trouble always seems to break out. If President Jacques Chirac and the centre-right government which supports him had been in full control of France's political life, it is hard to think these long days and nights of continuous rioting would have taken place. The feelings of resentment and simmering anger in the suburbs would have been just as strong, but the crowds would mostly have held back. Years of reporting on riots and revolutions have shown me that crowds display a mysterious collective sense which somehow overrides the perceptions and fears of the individuals who make up the mass. And crowds have a remarkable feeling for the weakness of government. There is of course a huge well of fury and resentment among the children of North African and African immigrants in the suburbs of French cities. The suburbs have been woefully ignored for 30 years. Violence there is regular and unexceptionable. Even on a normal weekend, between 20 and 30 vehicles are regularly attacked and burned by rioters. This time the riots are joined up, pre-planned, co-ordinated. At some level of consciousness, the demonstrators know that the governmental system they are facing is deeply, perhaps incurably, sclerotic. Mr Chirac, standing back until his ministers showed their inability to agree a clear line on the rioting, seems not to have the answers when he speaks now. His presidency is overshadowed by an inescapable sense of past corruption and weakness, and he has governed France at a time when its economy and its position in the world have both declined sharply and markedly. No matter that events have thoroughly borne out his criticisms of the US and British invasion of Iraq in 2003. The Muslim teenagers who briefly applauded him then have long since forgotten all that - though of course if he had supported President George W Bush and Prime Minister Tony Blair then, he would be in even greater trouble now. In 1968, too, President Charles de Gaulle and his ministers spoke sternly of the need for order to be restored immediately, and yet they did nothing. If the riot police could have restored order they would have done so, but they were overstretched and outwitted, and their only response was more of the kind of violence which made the crowds even more ferocious in their turn. 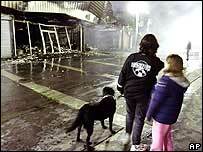 I remember the 1968 riots very well. But of course the differences between then and now were as great as the similarities. For a start, the riots of 2005 are still all about the bitter and genuine grievances of the Muslim and African communities, ignored and demeaned and kept in poverty by a system which cares very little about them. Only if a much wider swathe of French society gets involved on their side will the situation become truly pre-revolutionary, in the way that the crowds of 1968 were. And since the riots have taken on a fiercely anti-French tone, and the violence and destruction have sickened so many people in the suburbs themselves, that seems unlikely at present. France, though, tends to move forward in fits and starts, rather than organically, and these fits and starts are often associated with violence. Thanks to the Revolution, violence even has a kind of virtue which it simply does not possess in a country like Britain. When government becomes incapable of change, the crowds in the streets have to do the changing for themselves. There is a great deal that has to be changed. I have seen many times for myself how the CRS, the deeply aggressive and ferocious force of riot police, have attacked Muslims and Africans in the streets in times of trouble. Last April, Amnesty International singled out the violence and racism of the French police towards the non-white people of the suburbs for particular criticism. Nicolas Sarkozy, the Interior Minister, now seems to be playing politics with the situation by appealing to the most basic and resentful attitudes of conservative France. 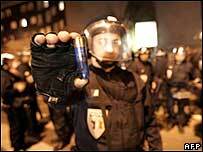 Much of the violence on the streets of France's cities is mindless; some of it is malign. But simply stamping it down will not work - and anyway the CRS and the civil police have tried that, and their toughness has only made things worse. France is going to have to change towards its unwilling, often unwelcome young second-generation population, and accommodate them better. It is not enough to demand that these people drop their sense of themselves and fit in with the way France has traditionally ordered its affairs. But most of all there has to be change in attitudes at the top. 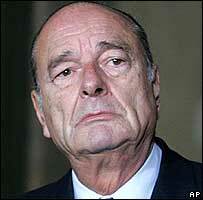 And if Mr Chirac cannot do it, he will be fatally damaged as president. Do you agree with John Simpson's view of the violence in France? How should the authorities tackle it? What are the major challenges in store for French society? The leadership in France is directionless and bereft of new ideas. When was the last time anyone looked to France for any initiatives on the international stage? If the French treat large segments of their own population to the same arrogance they do the rest of the world, is it really any wonder that it ends in mass rioting? France needs to focus on its domestic affairs and inject some fresh thinking that doesn't involve referring to French citizens as scum. After all, can anyone imagine a UK minister still being in office if they ever used similar language? I also remember the 1968 riots and the congruence of forces has not yet occurred in the current rioting. If the student population becomes engaged in the struggle for social justice then perhaps the situation could change. But, the hypnosis of materialism has co-opted much of this critical sectors' energy, a materialism that the protestors are both lured to and object to. If fundamentalists become even more influential by the ruling class' rhetoric and reactions, then France and the other postcolonial powers are in for even more troubled years ahead until they squarely and justly address the issues the protests raise. Confrontation will not work. Dialogue across the divide is what is required. I think it will be a great day when the French stop looking on every immigrant as a threat to their way of life, their prospects of employment etc - how many middle class Frenchman really want to clean dog dirt from the pavements or become a dustman? The day when there is a substantial mahgrebin middle class will be the day that some sort of integration will have been achieved. What is really frightening is that when this kind of rioting happened in the 80s and early 90s the young seemed quite politicised and now they seem to be looking to Islam as a solution. This is not jihad, this is poverty, marginalisation and deprivation. Yet again cheap labour based immigration policies are revealed for what they are. Dangerous short sighted exploitation! It's clear that the economic exploitation of people without their assimilation into the culture and shared hope for the future leads to alienation, hatred and contempt from the second generation. We've got ours brewing up nicely. Pity post colonial Europe didn't see this writing on the wall years ago. The 21st century, doesn't need a lumpen proletariate labour force , it already has enough of its 'own'. Mr. Simpson did not touch upon what I have encountered each time I visited France as a tourist. That is the general acceptance of open bigotry by the population in general. It is not just the police who harbour hostility toward minorities. It is the man on the street. I have been subjected to crude ethnic jokes by people who were sitting next to me in restaurants. Because I can understand some French I have been included in these insider joke-fests which each time have ruined my dinner and made me tense as I was forced to remain seated and digest the underlying feelings. Something is wrong and it will take major re-education to fix it. I strongly disagree with the appeasement mentality that the author displays. If anything, French authorities have not acted strong enough to eliminate the violence. Say what you want about American politics, but no American city would allow such rioting without activation of the National Guard and the ultimate crushing of the vandals. I do not agree with Mr. Simpson's view in the respect the that there is no easy solution, I believe there is and it is simply to restore order by force, meaning to bring in troops, restore order and deport any aliens taking part of this. It's hard to believe this situation has continued for more than two days and was tolerated. France needs to rid itself from these elements at any price. The French government has yet to learn from its past mistakes and there is a strong feeling of deja vu about the current unrest. In the early 90s a similar incident sparked violence in the suburbs, an event that was very well documented by the film La Haine "Hate". 13 years on and the French are still fighting fire with fire without examining the real cause of the resentment and anger vented by so many immigrants. Rather than laying down the law with heavy-handed tactics, isn't it about time somebody finally sat up and listened to the everyday problems and grievances of these people and strive to find a solution? Maybe it's time for a different kind of French revolution. Mr. Simpson's article is hopelessly biased to the left. 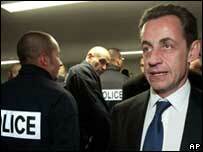 Why is Mr. Sarkozy "playing politics" by calling criminals criminals and by enforcing the law? Why do you heap criticism on the French government but give not an ounce to the malicious hooligans who have destroyed private property and now killed an innocent man? And why do you compare this to 1968? This is not a revolution, it's a mass criminal frenzy. The complacent and apologetic attitude of the European press will fan the flames of this activity much more than the hard-nosed attitude of Sarkozy.